Your guide to South Africa with a difference, comprising a wealth of unique insider country and tourism info. Learn all you want to know about this beautiful country of ours at the southern tip of Africa and make your visit an unforgettable experience. Where else in the world can you see such beautiful scenery, traveling from Oceans and Mountains, through beautiful vineyards or arid desert, from open bushveld, to tropical forest or to our fantastic beaches. Where else can you find such a diversity of people that eleven official languages are required. and helping you to learn more about this incredibly beautiful country of ours on the southernmost point of the dark and mysterious continent of Africa. That, dear visitor, is what this site is all about....Enjoy it! Find out everything you want to know about our country and its fantastic travel and tourism attractions and experience its rainbow culture. 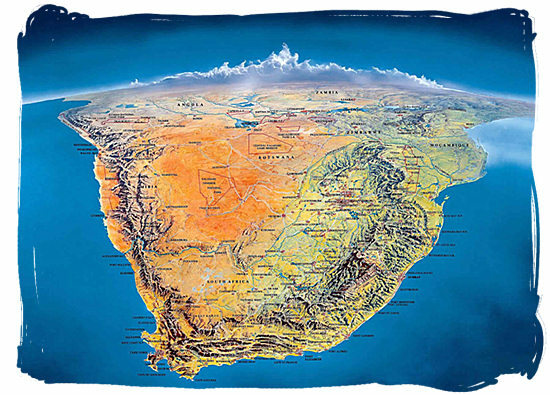 South Africa is to be found at the Southern tip of Africa, there where the Atlantic and Indian oceans come together. It features an incredibly diverse and awe-inspiring landscape, along with a high degree of bio-diversity. Almost all of the interior consists of one enormous plateau, separated from the country's extensive seaboard by long mountain ranges. As far as the administrative structure of our country is concerned, it consists of 5 regions, 9 provinces and three capitals. The latter being cities of Pretoria, Cape Town and Bloemfontein, acting respectively as the administrative, legislative and judicial capital. The economic and commercial center is Johannesburg, the country's largest city. An excellent road and rail network connects all the major centers together. One has to feel and live the rhythm of the country's new rainbow culture, a melting pot of European, African, Indian and many other cultures put together. From ancient rock art sites to modern galleries, from cultural villages to museums, from open air festivals to jazz clubs and many more. Venues ranging from deep bushveld to outdoor theaters, from botanical gardens to luxurious theater complexes and night clubs. These are some of the ways you can live, feel and experience our South African culture. There are all together seven World Heritage sites, proclaimed by Unesco's world heritage committee as "places of outstanding value to humanity". Bushmen family, descendants of South Africa's original inhabitants. The San people, also known as "Bushmen", are the earliest inhabitants of not only South Africa, but of the whole of Southern Africa. It is said that they have been living in these parts of Africa from as early as 30,000 years ago. Today their descendants are still to be found in some of the semi-desert areas of South Africa, Namibia and Botswana. According to Geneticists the San people have one of the oldest gene patterns ever identified. 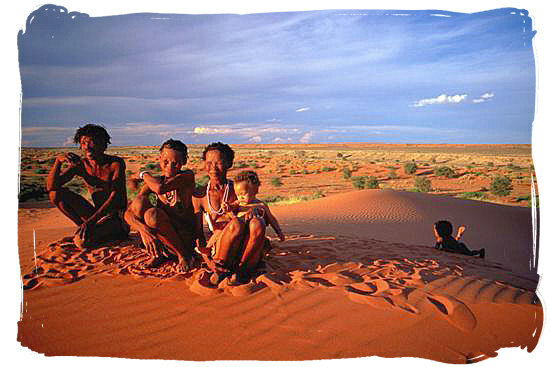 Bushmen family, descendants of South Africa's original inhabitants. The San people, also known as "Bushmen", are the earliest inhabitants of not only South Africa, but of the whole of Southern Africa. It is said that they have been living in these parts of Africa from as early as 30,000 years ago. Today their descendants are still to be found in some of the semi-desert areas of South Africa, Namibia and Botswana. According to Geneticists the San people have one of the oldest gene patterns ever identified. South Africa is home to around 49 million people, a population of highly diverse origins, backgrounds and cultures. It is here at the aptly named "Cradle of Humankind" near Johannesburg where signs of the very first population can be seen in the form of 3.5 million year old human fossils. Its population can be identified as follows; 79% Black, 9,6% White, 8,9% Colored and 2,5% Indian/Asian. Since its discovery, the earliest known populations were the tribesman of the San and Khoi people, commonly referred to as the KhoiSan. Even while they do have decedents in our modern day population, the KhoiSan people are sadly on the verge of extinction. Rainbow People. Words that have been derived from the term Rainbow Nation. It was first used by Archbishop Desmond Tutu to describe the multi-cultural nature of our country. The ingredients that form the basis for the melting pot of cultures called "The Rainbow People", are: the original inhabitants the San people, the variety of black tribes who arrived here during the Southern Migration, the Indian people who came here to work on the sugar plantations, the slaves of various Asian origins who were brought here by the Dutch during the Cape colonial period and a variety of white immigrants of different European origins who came to settle themselves here. Words that have been derived from the term Rainbow Nation. It was first used by Archbishop Desmond Tutu to describe the multi-cultural nature of our country. The ingredients that form the basis for the melting pot of cultures called "The Rainbow People", are: the original inhabitants the San people, the variety of black tribes who arrived here during the Southern Migration, the Indian people who came here to work on the sugar plantations, the slaves of various Asian origins who were brought here by the Dutch during the Cape colonial period and a variety of white immigrants of different European origins who came to settle themselves here. South Africa has 11 official languages and scores of unofficial ones besides. Some of these are mutually understood, with many South Africans speaking more than one besides their own language. Although each language is equal in status towards the other, the English language has emerged as the most widely used of them all. Next to its use as the main medium of instruction in Universities and Schools, it is also being used in official documents, on road signs and in commerce and industry. In addition to their own language, almost all South Africans speak and understand English. Fly, the beloved flag. Symbolizing unity in diversity, the new South African flag was adopted in April 1994 with the transition to the new democratic order. The colours red, white and blue represent the colours of the old Boer republics, while the yellow black and green represent the colours of the African National Congress. 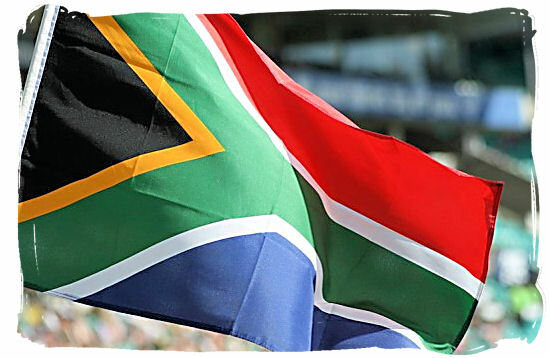 The flag first flew on 10 may 1994 with the inauguration of Nelson Mandela as the new State President. In general South Africa is blessed with a lovely and mild climate, comprising gorgeously sunny and warm weather, without being sweltering, and with mild winters. Do take note of the fact that the South African seasons are the reverse to those in the northern hemisphere. So yes, you can spend Christmas on the beach in our country. The interior and northern parts of the country with very warm summertime days cooled down by regular afternoon thunder showers, and crispy cool but sunny winters. The south eastern and eastern coastal region with its subtropical beach weather and moderate winters. The Western cape with its changeable mediterranean type of climats, consisting of windy springs, warm summers and wet chilly winters. Spring in Pretoria with the Jacaranda trees in full blossom. 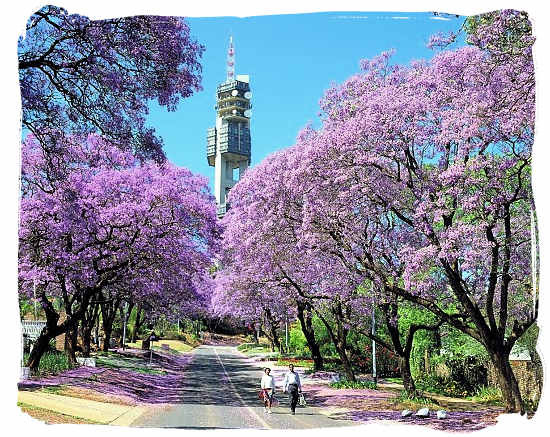 Pretoria is widely known as the Jacaranda City. The Jacaranda is a tree that has its origins in Brazil and other parts of tropical and subtropical South America. What makes the tree so special is its dense breathtaking floral display consisting of a huge canopy of purple/blue flowers and as they fall, these flowers form colourful carpet of blue. In Pretoria there are 70,000 of these trees. No wonder that it is nicknamed Jacaranda City. Spring in Pretoria with the Jacaranda trees in full blossom. Pretoria is widely known as the Jacaranda City. The Jacaranda is a tree that has its origins in Brazil and other parts of tropical and subtropical South America. What makes the tree so special is its dense breathtaking floral display consisting of a huge canopy of purple/blue flowers and as they fall, these flowers form colourful carpet of blue. In Pretoria there are 70,000 of these trees. No wonder that it is nicknamed Jacaranda City. One of the remarkable facts about South Africa is its level of bio-diversity, which is among the highest worldwide with an astonishing variety of plants, encompassing 22,000 species, many of them indigenous. The fact that our country is home to the Cape Floral Kingdom to be found in the Western and Eastern Cape provinces, makes it the only country in the world that has a complete floral kingdom within its borders. Home to 8,600 species, of which over 6,000 are indigenous, the Cape Peninsula alone contains a greater diversity of floral species than the entire Great Britain. South Africa is home to a staggering number of animal species, including over 300 species of animals, over 500 species of birds, more than 100 species of reptiles and countless species of insects. There can be little doubt that the "Big Five" (Elephant, Buffalo, Lion, Leopard, Rhino), are the most prominent four-legged members of its fauna. The time that massive herds of Zebra, Wildebeest (Gnu's), Giraffes, impalas and numerous other species filled the savannas of Africa is, sad to say, long past. To protect their heritage, it has a long standing record of conserving, protecting and rehabilitating its highly diverse animal population. Reserves and National Parks perform a key-role in this, providing safe havens for the wildlife and great tourist attractions for their visitors. Not to be outdone by the land crawlers, the marine life is equally exotic, boasting about 2000 fish species, comprising 16% of the total number of fish species worldwide. Probably the most spectacular and terrifying of these is the great White Shark. There is an abundance of bird species and snakes are a common occurrence in most parts of the country. 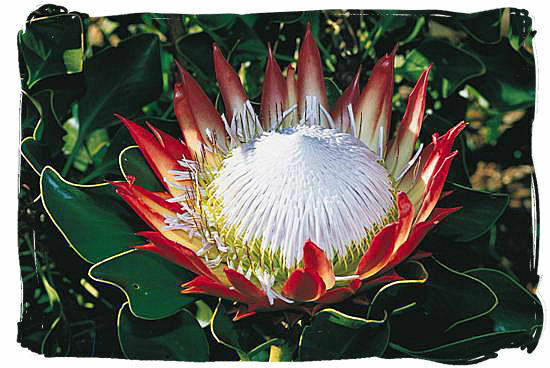 The King Protea, member of the unique South African Cape Floral Kingdom, and a distinctive representative of the ancient Proteaceae plant family, is one of South Africa's national symbols. Indigenous and part of the unique "Fynbos" Cape Floral Kingdom, it is an evergreen shrub with broad leaves, well-known for its beautiful flower-head, which is the largest in the genus. It is also known as Giant Protea, Honeypot or King Sugar Bush. King Protea, royal member of the unique South African Cape Floral Kingdom. A distinctive representative of the ancient Proteaceae plant family, the King Protea is one of South Africa's national symbols. Indigenous and part of the unique "Fynbos" Cape Floral Kingdom, it is an evergreen shrub with broad leaves, well-known for its beautiful flower-head, which is the largest in the genus. It is also known as Giant Protea, Honeypot or King Sugar Bush. Among the notable facts about the country are its health and medical standards, which are outstandingly high, meeting international standards without difficulty. Facilities are very much comparable with those found in Europe and the USA. The health care structure consists of a limited yet fast-growing public component and a large private sector component. A national health care scheme in the true sense of the word does not exist in South Africa. Medical and health care insurance is regarded as an individual and private responsibility which can be obtained from a substantial number of different medical scheme insurers, who offer a wide variety of choices to suit most people's needs and pockets. For those who cannot afford medical insurance, there is the public health sector, consisting of a structure of provincial and academic hospitals throughout the country. At grass-roots level a basic pre-hospital network of preventative health care facilities and services has been developed to bring basic medical care near to the people's doorstep. Using up more or less 11% of the national budget, the public health care sector is for the most part financed by the government. The quality of health care in South Africa compares with the best in the world. 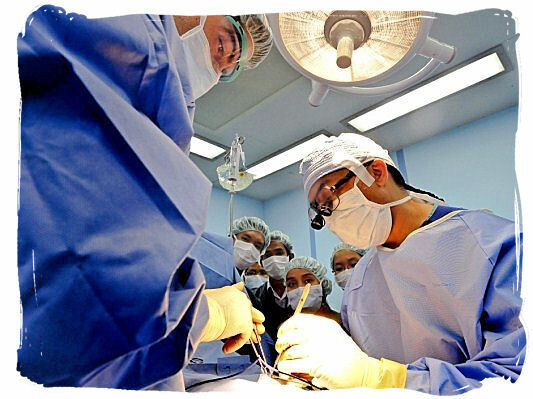 The country is well known for its medical knowledge and capability since the time that Professor Christiaan Barnard performed the first successful heart transplantation in the Grote Schuur hospital in Cape town in 1967. Today there are a many excellent private hospitals and university medical centres staffed with highly trained and skilled doctors, surgeons and nursing staff, ensuring that the country's level of medical expertise is of world class standard. The quality of health care in South Africa compares with the best in the world. The country is well known for its medical knowledge and capability since the time that Professor Christiaan Barnard performed the first successful heart transplantation in the Grote Schuur hospital in Cape town in 1967. Today there are a many excellent private hospitals and university medical centres staffed with highly trained and skilled doctors, surgeons and nursing staff, ensuring that the country's level of medical expertise is of world class standard. One of the lesser known facts about South Africa is that its new post-apartheid democracy built upon a new constitution and "Bill of Rights", is considered to be one of the most progressive ones in the world. The country has a parliamentary government structure, and an independent judiciary. The government is decentralized in local, provincial and national tiers of government, each with its own elected house of representatives and executive, all based on a system of cooperation and interdependence. The three-level structure of government has been chosen and designed in acknowledgment of the interests and needs of the country's population, each tier of government having its own distinct power and responsibility structure. The national level of government consists of the National Parliament with 400 representatives elected by popular vote and the National Council of Provinces with 90 provincial representatives, 10 from each province, nominated by their respective provincial legislatures. South Africa is a republic with a president as executive head of state and head of the cabinet. The president is elected by the National Parliament for a term of five years. He can be elected for a second term, but that is the constitutional maximum that he is allowed to serve. 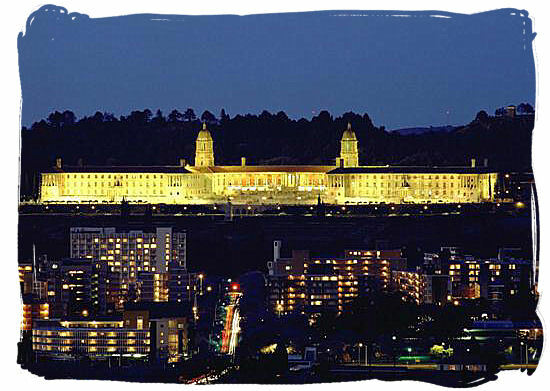 The Union Buildings in Pretoria, is the official seat of the South African Government and also the place where the office of the state president is to be found. Built from light sandstone, it was designed by the famous architect Sir Herbert Baker in 1908. Surrounded by beautiful garden terraces and a kind of amphitheater at the front, the monumental building is situated at the highest point in Pretoria, on top of Meintjeskop hill. The Union Buildings in Pretoria is the official seat of the South African Government and also the place where the office of the state president is to be found. Built from light sandstone, it was designed by the famous architect Sir Herbert Baker in 1908. Surrounded by beautiful garden terraces and a kind of amphitheater at the front, the monumental building is situated at the highest point in Pretoria, on top of Meintjeskop hill. As mentioned earlier, the first known inhabitants of our country were the San and the khoi people, collectively known as the khoisan. 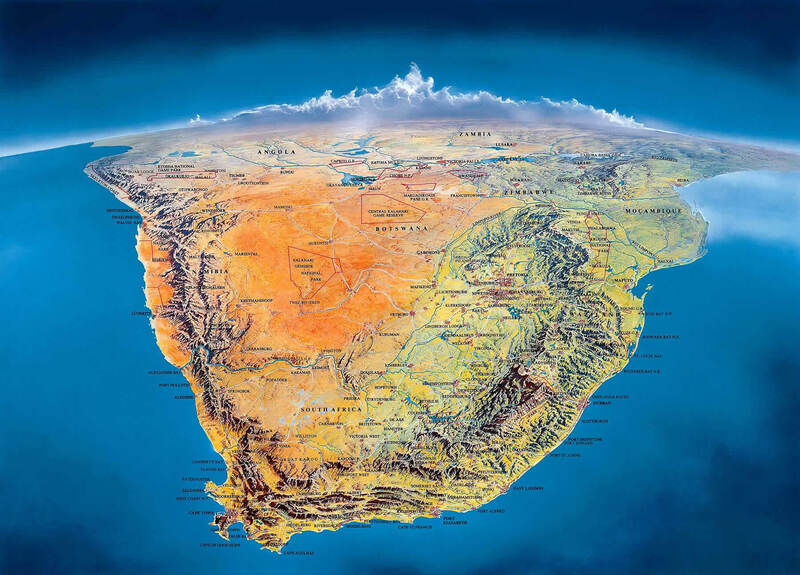 They inhabited the southern tip of the African continent thousands of years before the first Europeans arrived at our coasts. Africa's populations in central and northern Africa were growing fast, necessitating enlargement of territories, which resulted in a nomadic lifestyle and eventually migration of these populations some 2000 years ago, hundreds of years before the first European arrivals. They were Jan van Riebeeck and his 90 crew members, under instruction from the Dutch East India Company, to build a supply station at the Cape of Good Hope for their eastern trading route. It was this relatively informal settlement of European expats which set the wheels in motion for colonial expansion that led to the settlement of the white population we see today. As is typical of colonization, the seeds of racial strife and conflict were sown. Over the years, the seeds cultivated and festered into what finally resulted in the infamous era of Apartheid and freedom struggle. 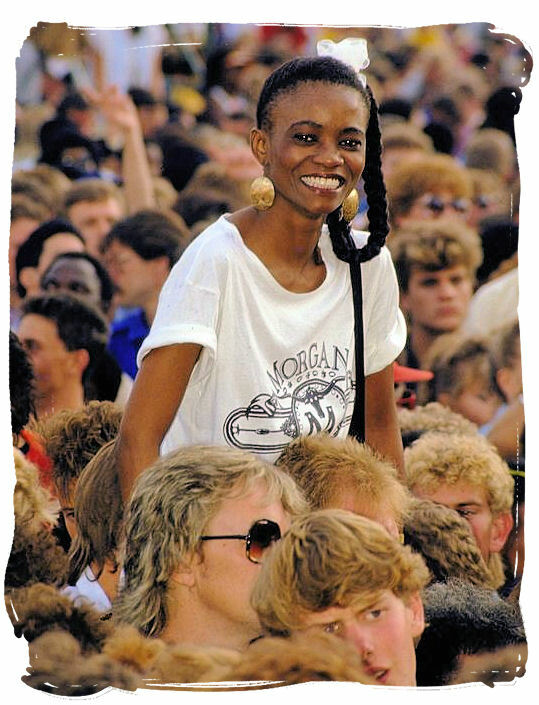 At the end it was victory to the freedom struggle and defeat of apartheid in February 1990, when Nelson Mandela and all other political prisoners were released from prison. The first free and democratic government under one of the most progressive constitutions was elected in April 1994. 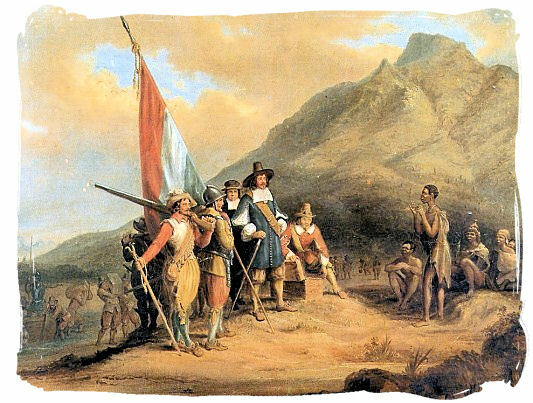 Arrival of Jan van Riebeeck in 1652, the first European to settle on South African soil. Sent by the Dutch East India Company, Jan van Riebeeck and his company arrived in the Cape in 1652 to set up a refreshment station for the ships rounding the cape en route to India. They were the first Europeans to settle in South Africa. This painting by Charles Davidson Bell, Surveyor-General of the Cape Colony in 1848, depicts the encounter between Jan van Riebeeck and the original indigenous inhabitants, the Khoi people. Arrival of Jan van Riebeeck in 1652, the first European to settle on South African soil. Sent by the Dutch East India Company, Jan van Riebeeck and his company arrived in the Cape in 1652 to set up a refreshment station for the ships rounding the cape en route to India. They were the first Europeans to settle in South Africa. This painting by Charles Davidson Bell, Surveyor-General of the Cape Colony in 1848, depicts the encounter between Jan van Riebeeck and the original indigenous inhabitants, the Khoi people. The industrialization of south Africa commenced with the discovery of gold in 1886 on the Witwatersrand. Together with the earlier discovery of diamonds it formed the foundation on which it into the economic power station of Africa as it is today. With a GDP that is equal to 25% of the total GDP of the whole of Africa. South Africa's highly developed financial and physical infrastructure presents the perfect investment platform for access and entrance into markets of other African countries. Mining is one of the biggest economic cornerstones of our economy, especially platinum, gold and diamonds, accompanied by manufacturing which adds value to the wealth of minerals and base materials. Tourism is another economic factor which adds to the country's booming growth, and it is quickly becoming one of the most favorite travel destinations as it draws more positive attention to itself. The 2010 World Cup proved that South Africa has unlimited potential for future investors. Expected economic growth (2013) = 2,7%, expected consumer price inflation (2013) = 5,5%, expected growth of investment (2013) = 5,7%, Unemployment (2013) = around 25%. Largest trade and investment partner = Europe. 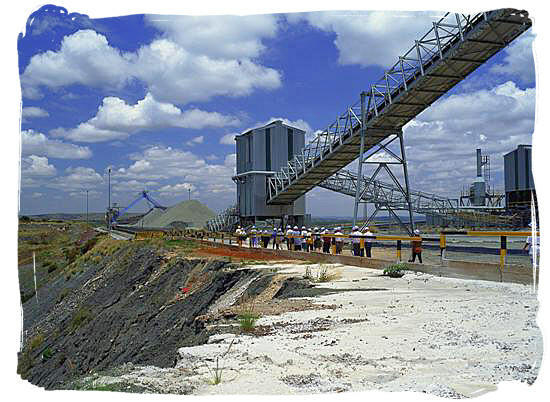 A picture of a modern gold mine in the Free State province of South Africa. The gold and diamond mining industries are two corner stones of the South African economy. It all started with finding the first diamond on the banks of the Orange River in 1867 and the Witwatersrand gold rush in 1886. Among the many gold mining operations in South Africa are two of the deepest mine in the world, the TauTona mine in Carletonville with a depth of 3,900 metres and the East Rand mine at Boksburg with a depth of 3,585 metres. A picture of a modern gold mine in the Free State province of South Africa. The gold and diamond mining industries are two corner stones of the South African economy. It all started with finding the first diamond on the banks of the Orange River in 1867 and the Witwatersrand gold rush in 1886. Among the many gold mining operations in South Africa are two of the deepest mine in the world, the TauTona mine in Carletonville with a depth of 3,900 metres and the East Rand mine at Boksburg with a depth of 3,585 metres. Comprising 28 000 schools, 386 000 teachers and 12 million learners, the country has a well-developed first world standard education system. Of all the schools, which include 1200 registered private schools and 390 special needs schools, six thousand are secondary schools, while the others are primary schools. With an enrollment of over a million students, the countries higher education domain which includes 21 Universities, 15 Technicons, is very much alive and dynamic. They are independent, reporting to their own governing bodies rather than being controlled by government. Many of our universities are world-class academic institutions, at the forefront of scientific research in a number of spheres. Young school children in conversation about their schoolwork. Going to school in South Africa is compulsory for children from their 7th to their 15th year. In 2013 the country counted 12,489 648 school children, 25,720 schools and 425,023 teachers. The total school-going period covers 13 years or grades, including the matriculation year. The grades 0 to 9 comprise the primary phase and the grades 10 to 12 the secondary phase. All school children are required to wear the school uniform when attending school. Young school children in conversation about their schoolwork. Going to school in South Africa is compulsory for children from their 7th to their 15th year. In 2013 the country counted 12,489 648 school children, 25,720 schools and 425,023 teachers. The total school-going period covers 13 years or grades, including the matriculation year. The grades 0 to 9 comprise the primary phase and the grades 10 to 12 the secondary phase. All school children are required to wear the school uniform when attending school. South Africa is very fortunate to have a climate that is perfectly suited for outdoor sporting activities. It comes as no surprise that the vast majority of South Africans have always had a great passion for sport, taking their country to become one of the top performers in the world It is common knowledge that sport has been a major contributing factor in uniting the country and its people going through the transformation from Apartheid to a new totally free democracy. Rugby, Cricket and Football (Soccer) are but a few of the major sports that the country has excelled in. For close on a century, it has regularly fielded teams of world-beating class. Soccer has endeared itself mostly to the black population, and young and old can be seen getting very animated over it. Even while it is famous for its feats in these popular sports, the country has also delivered over-achievers in the world of boxing, golf, swimming and marathons. The country has proved itself on an international level many times over, not just with its athletic prowess, but also by hosting international sporting events. The 1995 Rugby World Cup, and the famous 2010 Football Championship were a huge success. The Wanderers Cricket ground in Johannesburg. 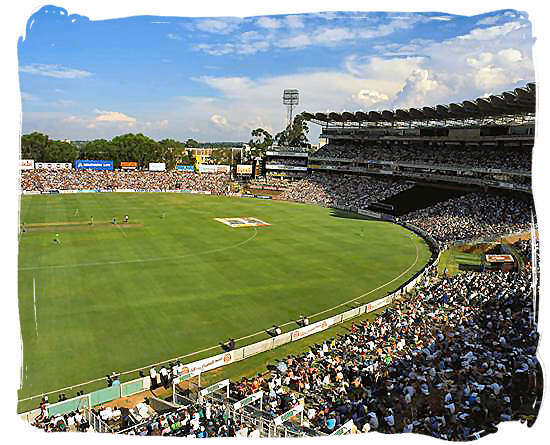 Situated just south of Sandton in Johannesburg and able to accommodate up to 34,000 spectators, Wanderers stadium is certainly one of the most famous stadiums in South Africa, if not worldwide, and is used almost exclusively for cricket matches. It was home to the Cricket World Cup final in 2003 and was also host to one of the greatest one-day matches in history between South Africa and Australia with South Africa chasing down a world record score of 434 runs. The Wanderers Cricket ground in Johannesburg. Situated just south of Sandton in Johannesburg and able to accommodate up to 34,000 spectators, Wanderers stadium is certainly one of the most famous stadiums in South Africa, if not worldwide, and is used almost exclusively for cricket matches. It was home to the Cricket World Cup final in 2003 and was also host to one of the greatest one-day matches in history between South Africa and Australia with South Africa chasing down a world record score of 434 runs. 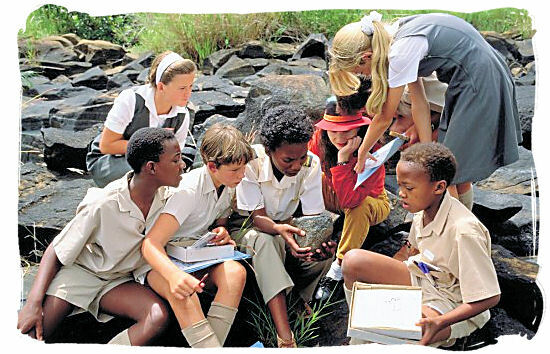 South Africa is without doubt one of the most diverse and fascinating countries on our globe. A country with a spectacular blend of landscapes, people, history, culture and wildlife, offering you tours and travel experiences beyond your wildest dreams and expectations. Us locals have long known it, ours is the most beautiful country on earth and millions of tourists seem to agree. The 2006 UK Readers tourism travel awards gave South African scenery a score of 97.8% which is the highest in the world. It was also voted the worlds 5th best tourist destination, while it has ranked in the top 20 destinations for the last 6 years.